This model offers very good value - if you need a combi microwave and you're on a budget then it's well worth considering. Some Daewoo models have had reliability issues - we have yet to experience this though. We recently reviewed a very similar model to this, the KOC9Q1T - which is identical to this model except for the colour - the Daewoo KOC9Q1TSL is finished in silver instead of white. 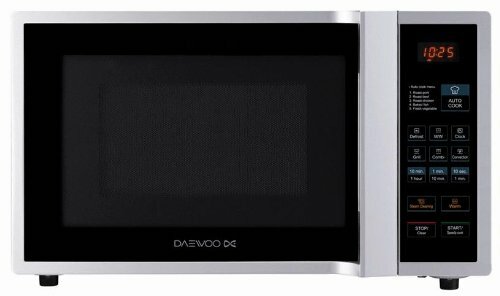 This Daewoo microwave works well, and also offers excellent value for money - featuring a 900w microwave, 2700w oven mode as well as a grill, and all for around the £120 mark. This considerably less than the vast majority of other silver microwaves on the market. The stainless steel interior is easy to clean, complete with an in built steam facility to make it easier still. The microwave's controls are clearly labelled with both text and graphics, you'll find it easy to control. The microwave mode features 10 different power levels, as well as five auto cook selections - this time saving feature which will make cooking regular dishes simple. The 900w of power mean this microwave cooks pretty fast when on the highest setting - bear this in mind if this model is the replacement for a less powerful older microwave. Overall build quality of this microwave was pretty good - the design looks smart, and will suit the majority of modern kitchens. If you can't afford a high end microwave, yet want a large capacity stainless steel combi microwave, then the Daewoo KOC9Q1TSL will tick that box. I only want to use it for simp;e things and, at the moment, am only using it to heat up beans and simi;ar.